It sure doesn't feel like Friday. But it most certainly is. 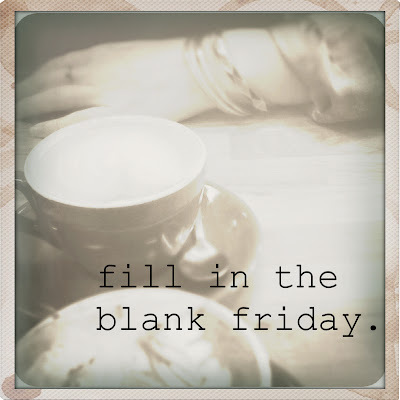 Linking up with the little things we do for another, Fill in the Blank Friday! Waking up at the break of dawn to go shopping is my idea of not my idea at all. I must admit that I did some shopping today... But certainly not after getting a full 9+ hours of sleep. If I were to go shopping today I would be on the hunt for Christmas gifts for my nieces and nephews. I was on the hunt today for said gifts. And I dominated. The best thing I ate yesterday was my aunt's pumpkin cheesecake. It was incredible. Something I've been learning lately is that it is OK to speak your mind. I have known this for a long time. But lately I've been doing it. I cannot start my day without my contacts/glasses. Or breakfast. My nighttime attire consists of a t-shirt and comfy pants. And perhaps one of Ryan's sweatshirts. I am looking forward to Christmas and buying gifts for family!